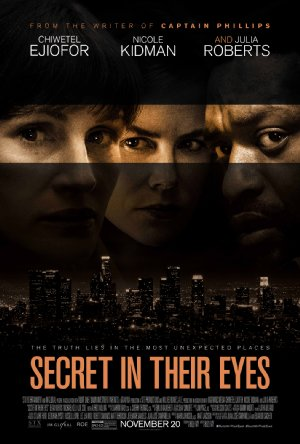 FILM REVIEW – SECRET IN THEIR EYES. With Chiwetel Ejiofor, Nicole Kidman, Julia Roberts, Alfred Molina, Michael Kelly. Written and directed by Billy Ray. Rated PG-13 for thematic material involving disturbing violent content, language and some sexual references. 111 minutes. A remake of a Spanish thriller, SECRET IN THEIR EYES manages to rises above its pulpy plot with the help of its three leading performers. They make us take it much more seriously than we might otherwise. Plot details, of necessity, will be sketchy. In the present, Ray (Chiwetel Ejiofor), is a former FBI agent who now works for the New York Mets in some capacity. However, thirteen years earlier he was detached to work with the Los Angeles Police Department as part of their counter-terrorism unit. A murder of a young woman occurs connected to someone in the department and for reasons that slowly unfold over the course of the film, the perpetrator was not prosecuted, but was allowed to get away. He then disappeared. Ray has spent the years since trying to track him down and now believes he has. He returns to L.A. where he encounters Claire (Nicole Kidman), once a homicide detective but now the district attorney, and Jess (Julia Roberts), who has become a top investigator for the department. Ray’s relationship with both women is somewhat complex, and part of the motivation for his obsession with the case. The story is told in a non-linear fashion, so we really have to pay attention. A snide detective (Michael Kelly) is bald in the present but has a full head of hair in the flashbacks. Jess is somewhat perky for a cop–although that’s not a reflection on her competence–and now looks, as one character puts it, like she’s a million years old. Claire, on the other hand, seems to have grown in confidence. As we move back and forth in time there are a number of mysteries to be resolved. Like a page-turner, it’s a movie that keeps you wanting to know what happens next. Eventually everything falls into place. It’s not a very deep story, and this is where the cast comes in. All three of the leads bring their A-game, making the material seem more important than it is. Ejiofor is obsessed, and not only for justice. Kidman seems cool and superficial but is slowly shown to have hidden depths, including in a devastating interrogation scene where we’re stunned at where her character goes. As for Roberts, her first appearance in the present day story is a bit of a shock as she appears without makeup (or, seemingly so), and looks as if the years have not been kind. The three of them make this a much better film than it might have been with lesser performers. Writer/director Billy Ray keeps our attention in the shifting back and forth in time which makes us feel the disorientation of the characters. It’s not that the story is difficult to follow. This isn’t a cinematic puzzle like “Memento.” Yet as we have to keep up with the characters and their changing motivations on two time tracks, it’s a juggling act nonetheless.